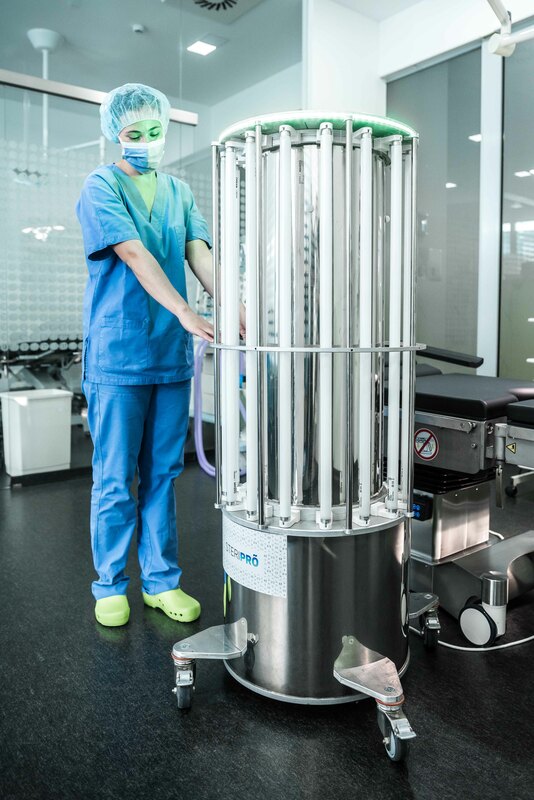 The biggest advantage of SteriPro disinfection technology is that it can also be used as a preventative measure, which results in a healthier environment for the patients, healthcare professionals and all those daily exposed to the risk of infection with microorganisms. By using the SteriPro technology, we actively contribute to the reduction of the costs of treatment directly associated with hospital acquired infections (HAI) and consequently reduce the need for the prescription of antibiotics, the efficiency of which is slowly fading (because of too frequent use). The SteriPro device is intended for a fast and efficient disinfection of premises. It is used to disinfect all types of hard surfaces, air and shaded areas. It is suitable for the disinfection of operating theatres, hospital rooms, intensive care rooms, restrooms, hospital halls, isolation rooms, restrooms and other premises, ambulances, industrial kitchens, large food preparation areas, health resorts, kindergartens, schools, old people’s homes, pools, etc. The use of the SteriPro device is recommended everywhere where there is a risk the presence of harmful microorganisms, since the standard cleaning procedures (mechanical chemical cleaning) cannot guarantee 100% disinfection. SteriPro has an inbuilt scanner to measure the size of the room and use the data obtained to calculate the optimal time needed for efficient disinfection. Extremely short disinfection period - for efficient disinfection, a 10 - 20 minute cycle is sufficient for a room of the size 15 - 20 m2. The disinfection cycle is always optimal and adjusted to the size of the room. Reduces the time between operations (due to reduced period of disinfection compared to the time required for mechanical cleaning). Environmentally-friendly disinfection - without the use of chemical means and consequently smaller impact on people and the environment. The UV-C disinfection is extremely efficient in itself, but it is as a rule used as an upgrade to the established cleaning protocols. The results of the research show that only about 50% of areas are appropriately cleaned* after mechanical cleaning with chemical cleaning agents, which is why the use of additional UV-C disinfection is absolutely justifiable and recommended. The device is intended for the use in closed rooms. As safety comes first, SteriPro is equipped with numerous security mechanisms, such as motion sensors, emergency stop button and colour LEDs marking the status of the device. All of this guarantees safe use for the user. If motion sensors detect any movement in the room during the disinfection process, SteriPro automatically and immediately terminates the disinfection cycle (to prevent potential injuries). The role of safety mechanisms, automation and operation via a smart tablet is in the elimination of human errors. 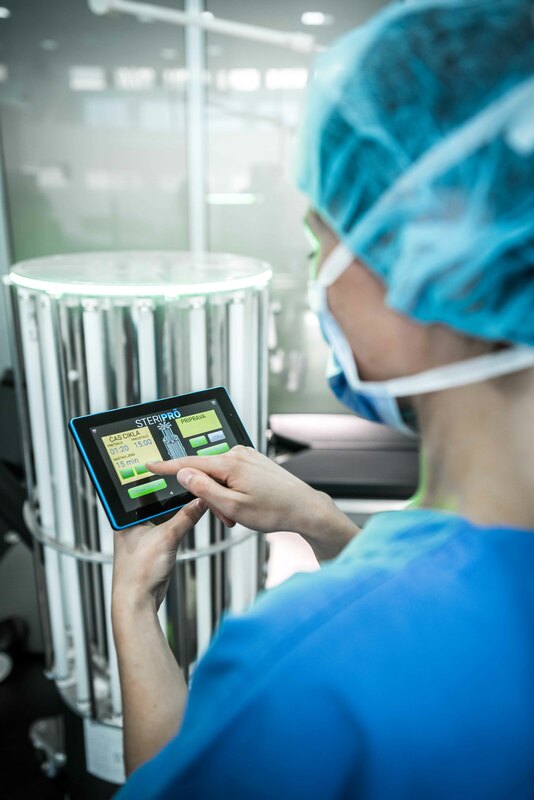 The SteriPro technology allows for the traceability of processes, which means that you can check, at any moment, which rooms had already been disinfected, when and how long was the cycle, who operated the device. It is not necessary to deactivate the ventilation system during the use of the SteriPro device. The SteriPro device is mobile, which enables simple transport from one room to another. (It can be used at any place and any time). SteriPro is designed to be used also for the disinfection of an ambulance of standard dimensions. Authorised service in Slovenia guaranteed. Secure a lifetime warranty by buying the yearly servicing programme.